Bouncing Buttons crafts making it simple: One last post on wool shorts. This will be my last wool shorts post. I might make more next summer. I already had a stack of wool pants, shorts, and soakers that I made a long time ago. I must confess I only have one fitted diaper in my diaper stash at the moment. All my diapers are pockets. I do love making wool shorts but I don't have a use for them right now. I need to make some fitted diapers up so I can use them. 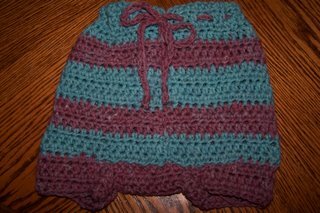 Anyway, my point is I have to stop making them if my DH sees another pair of shorts around he is going to start asking questions about why the house is filling up with koolaid colored shorts we aren't using. LOL! I need to move on to a craft that my family can use. I am kind of sad because I don't think I will find another craft this fun. Above is a picture that shows what I created with my kool-aid dyed fisherman's wool. They look kind of fun all together. 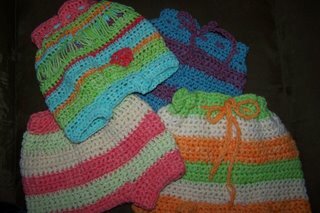 The short in the picture above is one I made up the same way I did the orange, green, and off white shorts. I just skipped every other or every third stitch (not sure I didn't write it down) to bring in the top. I like look with the front tie so if I do ever use this pair of shorts I might add in the tie just for looks. My DD is very thin she might need the tie to help keep them up. 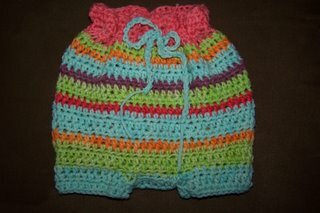 This pair I did in half double crochet. Same pattern just less rows. I made it to the same length as the others. This one took the longest but was the most FUN to make. I finished it up last night. I used all my last bits of yarn in a random order. 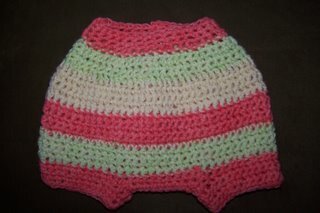 I used a half double crochet stitch and make it the same as all the others. Above is the front view. 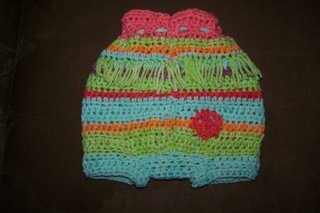 Below is the back view. I added some green fringe trim and a peace sign. I think it looks better in person than in the picture. I think it looks FUN.... I haven't showed it to my DH yet. I have a feeling he won't like it at all. It isn't his style. Maybe in a month or so when the temp. drops a little more DH will ask me to make up some more wool pants. If my DD would grow a little faster I would have an excuse to keep making stuff. KWIM?